I thought I’d start by showing this chart because it’s as clear a representation of changing habits as can be seen in the report. The steady increase in music streaming and digital music collections as one moves down the age groups from 65+ towards the younger end is clear to see. What’s particularly interesting is to see the parity between all three formats within the 25-34 age group, which clearly represents the changing of the guard, where streaming (but also owned digital downloads) becomes more popular than ownership. Convenience and price are clearly more important than ever. No surprise here, but the chart below does add some interesting context. The two sharply inclining lines represent smartphone (red) and tablet (blue) usage. Smartphone usage has risen from 39% in 2011, to 51% in 2012 and 61% in 2013. Tablets, though, have seen a more astonishing rise, pretty much doubling year on year, from 11% to 24% (2011 to 2012), then 24% to 44% (2012 to 2013). The proportion of mobile internet users purchasing goods has increased from 20% to 24%, 2013 to 2014. And these shoppers, as well as growing in number, are also spending more each quarter. This is one of the more pronounced trends in the advertising realm. 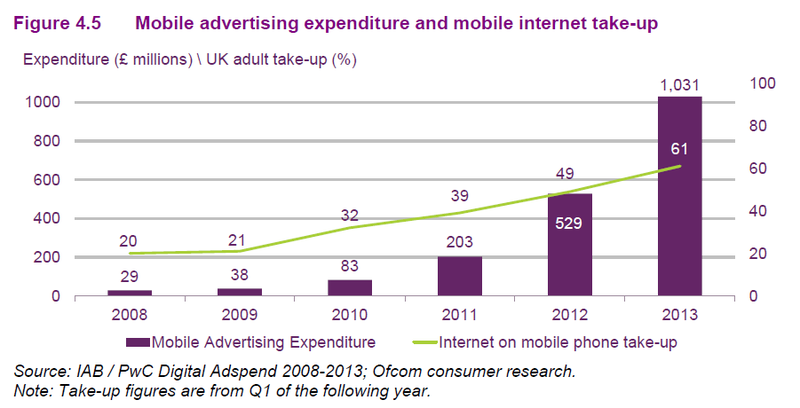 Mobile ad expenditure has doubled to more than £1bn in 2013. With 2014 also proving to be a big year for mobile ads, this level of increase may yet be maintained. See Econsultancy’s New Mobile Display Ecosystem report for more information. 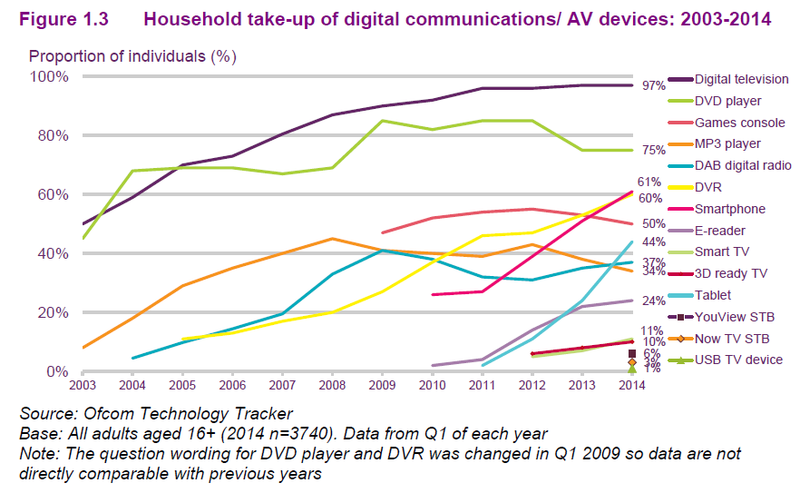 This chart shows perhaps some respite for those that are slow to adapt to mobile. Those that use desktop, laptop, tablet and smartphone rate the tablet as their most important device for internet access. With more people browsing in lean back mode, the tablet is increasingly important for ecommerce, outstripping (for perceived importance) the smartphone.